Easter markets are popping up all over Germany, and we visited the market at Sankt Wendel this weekend. 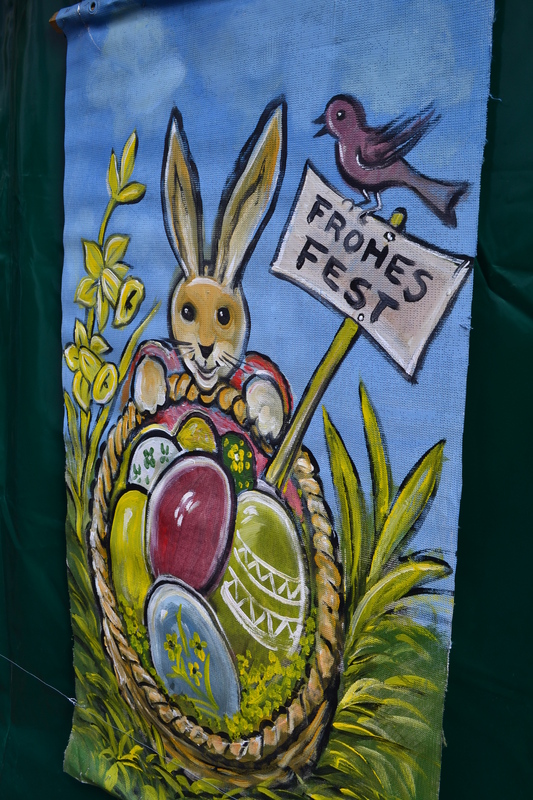 It was busy with market stalls full of painted Easter eggs, wooden Easter crafts, flowers, and jewelry. There were craft stations for children and food and drink for everyone. It was a nice day out, especially with the sun shining brighter than it has in many weeks. 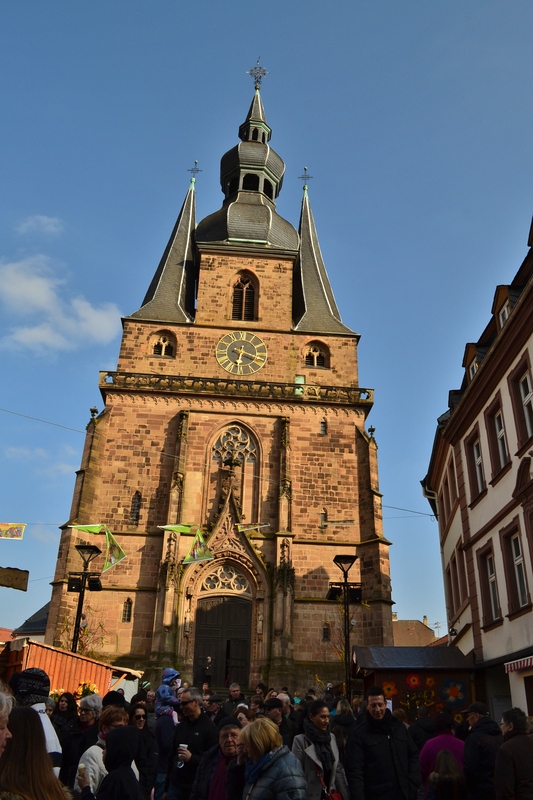 Our favorite sights at the market were the Easter Bunny displays and the fantastic Dom (Church) in Sankt Wendel. The church was the center point of the market festivities, with stalls huddled around her walls. The photo at left doesn’t do the exterior of the church justice–in the busy, small streets around the church it was hard to get a photo that shows the fantastic double-onion dome (with a third tier “cap” and cross set above the domes) in proper perspective. This church is stunning. 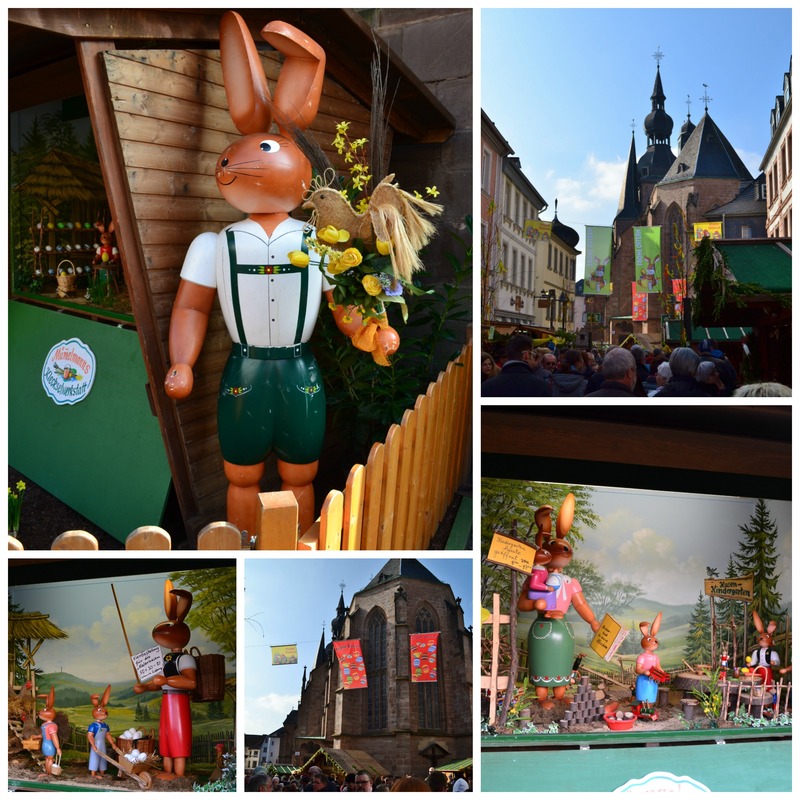 The Easter Bunny displays at Sankt Wendel were lots of fun too–a little whimsy and a lot of artistry. 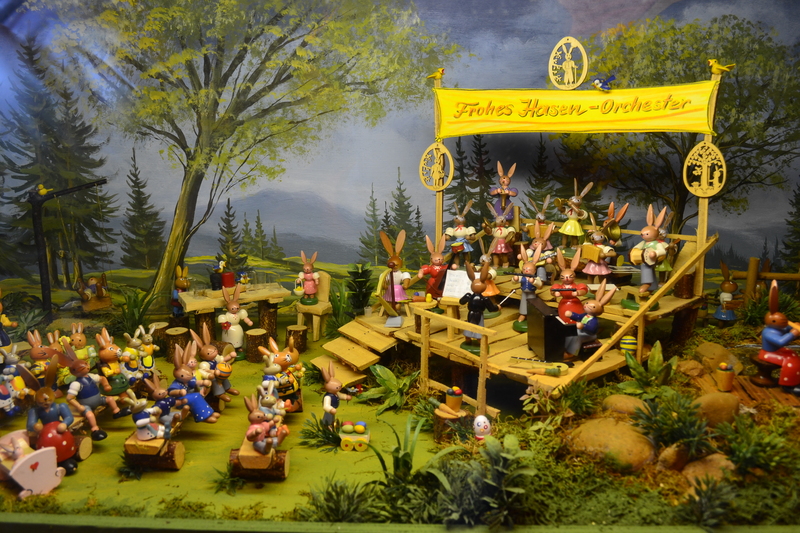 But, like so many German traditions, these displays got me thinking. Where did this story of the Easter Bunny get started? It seems obvious that America inherited its Easter Bunny traditions from Germany, as the Easter Bunny is not ubiquitous in Europe. In France, for instance, the Easter Bells (Les Cloches), having flown off to Rome in the days before Easter morning, fly back home and bring eggs and chocolates to children. But what made the Lutherans think up this magical bunny? Well, they borrowed from earlier traditions too. In German, this Easter Bunny is know as the “Osterhase” (the Easter Hare), and it’s widely accepted that many roots of our present Easter traditions come from pre-Christian traditions. The goddess Eostre (and her symbolic rabbits) were a focal point for spring fertility rituals. Fertility, bunnies, eggs–you can certainly see the echoes in present day traditions. You see the same pattern in Christmas traditions–the Christian holiday did pick up some flavoring from the Roman Saturnalia holiday that came before it. We’re all magpies in some respect–we incorporate bright scraps we find and fancy here and there, and we add those scraps to our nests. No holidays, religious or otherwise, spring fully formed from a doctrine or ideology–they incorporate the surrounding culture. This may seem odd when the surrounding culture is pagan and the newer holiday is Christian, but hearts and minds change slowly, piece by piece, person by person. Any slow turn of a culture will incorporate what its ancestors held dear, no matter how odd a pairing those ideas and traditions are. Flying bells? Easter bunnies? A little odd if you think about it logically. But, really, if all of our stories hinged solely on logic, we’d be all out of beauty and mystery. We’d be done for. Long live the Osterhase!! Frohe Ostern! Happy Easter to you! Next > March Madness, An American Tradition . . .
Beautiful! Gorgeous church 🙂 Thanks. Thanks for reading! It was a great church– a nice find! Great photos of the church and a wonderful story. Thanks. It was a lovely church. I don’t know why the Lutherans thought up the magical bunny; but I think that’s one bunny I won’t chase. I love that lederhosen-clad bunny at the start of the post. Actually, all those bunny displays look charming, but I love his unusually muscley rabbit physique! Funny, the lederhosen didn’t even stand out to me. I guess I’ve been in Germany long enough for lederhosen to look normal– whoa! The Osterhase hasn’t any Christian reference. Martin Luther “invented” the Christkind to displace the catholic saints but there wasn’t any need to do displace some catholic “egg- bringer”. Regardless, we gobble our chocolate bunnies each year, and happily so. Thanks for dropping by .